Entanglement and nonlocality in a two-site coupled-cavity system composed of two harmonic resonators and two Λ-type three-level atoms, in which each cavity contains a Λ-type three-level atom and the two sites are coupled with each other. Entanglement, as a peculiar quantum phenomenon, is so important and we need carefully study on its features. No instrument can directly measure the quantum entanglement of a system at present. Both theory and experiment, following the well-known Bell inequality, reveal the existence of the entanglement phenomenon in quantum mechanics, which is incompatible with classical correlations. Investigating the entanglement of a system helps us to understand the complex phenomenon of nonlocality. These features make quantum entanglement essential to quantum information science. To examine the characteristics of quantum entanglement, optical-field manipulation group led by Prof. Hui-Tian Wang from National Laboratory of Solid State Microstructures and School of Physics, Nanjing University, carried out the research of entanglement and nonlocality in a two-site coupled-cavity system, in which each cavity contains a Λ-type three-level atom. Related research results are published in Photonics Research, Volume 5, No. 3, 2017 (Z. Zhang, et al., Entanglement and nonlocality in a coupled-cavity system). Coupled-cavity system, allowing the manipulation of states of quantum system, is a kind of perfect candidate for quantum entanglement, in which a Λ-type three-level atom is embedded in each of the two cavities. The intersect states, the pure atomic state, and all photon states play different roles according to different parameters, but they are connected with the entropy of the system based on the von Neumann entropy method. Bipartite entanglement entropy and nonlocality were examined, which definitely indicated the existence of entanglement in the ground state. 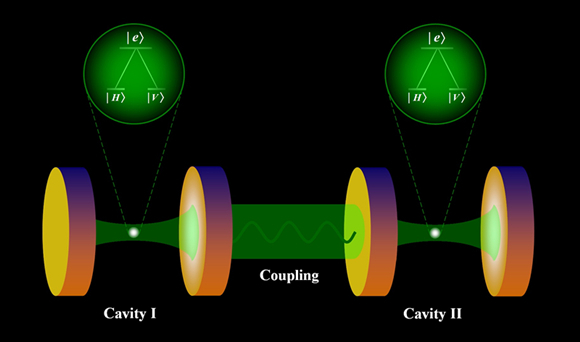 As the detuning changes, however, the entanglement between the photons in different cavities may become so small that the classical effect plays an important or even a main role in the experiment. Prof. Hui-Tian Wang believes that this work should have important reference significance for understanding and exploring the multipartite entanglement and nonlocality in multiple coupled-cavity system in the future and enhancing the capacity in the quantum manipulation. Further work will focus on extending the present method to the multiple coupled-cavity system embedded with the Λ-type three-level atoms, and the two and multiple coupled-cavity systems embedded with the other three-level atoms.